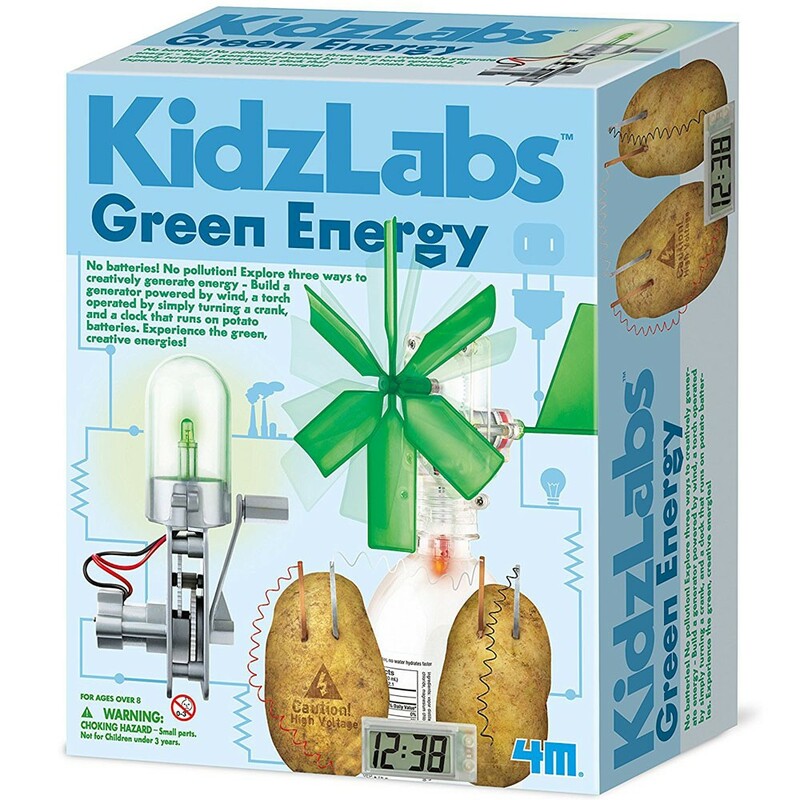 Go green as you build and experiment with the potato-powered alarm clock, windmill and dynamo torch generators, finding the alternative ways to produce energy. 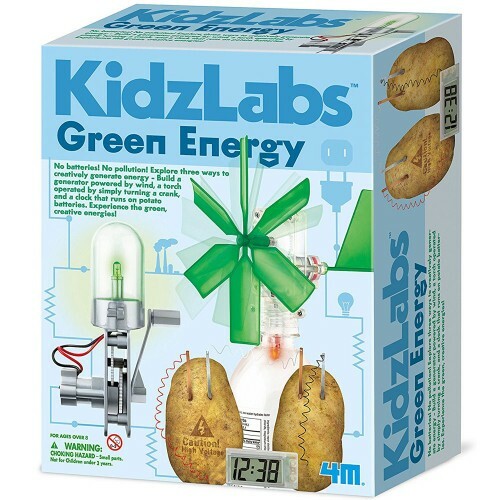 The new 4M Green Energy 3 in 1 KidzLabs Combo Science Kit lets the young explorers generate and manipulate energy in 3 different ways. 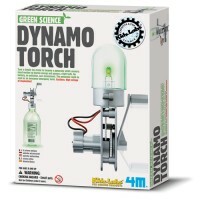 This science set includes 3 popular green science kits from 4M: Windmill Generator, Dynamo Torch Generator and Potato Clock experiment kits. 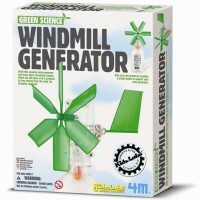 Use a plastic bottle from your recycling bin, along with the contents of this science toy from Educational Toys Planet to make a working 5-inch windmill generator that powers an LED light. 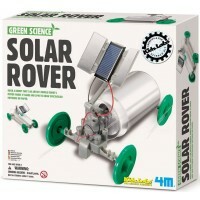 With this green science kit for kids you can make your own hand-operated generator and learn how hand-motion is transferred into electrical energy, with the ability to power a light bulb. 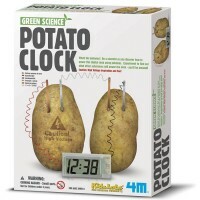 The 4M science kit contains a digital clock and all the building parts needed to run the potato-powered alarm clock, expect you provide the spuds. 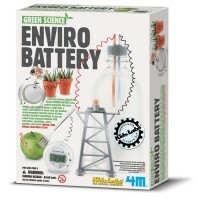 Green Energy 3 in 1 KidzLabs Combo Science Kit includes the instructions how to conduct the energy experiments. 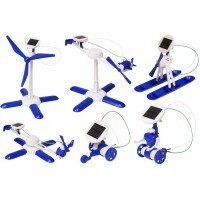 This science set does not require any batteries, because kids will learn the new alternative ways to produce energy. 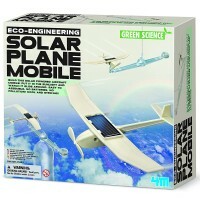 Dimensions of package 3.63" x 3.75" x 3.75"
Write your own review of Green Energy 3 in 1 KidzLabs Combo Science Kit. 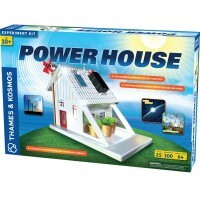 Rating: 4 by Jessica, FL The projects were fun and entertaining. 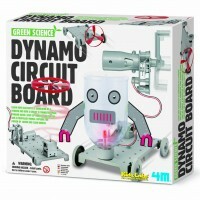 The only problem with this product is that my friends daughter wanted to do them immediately, and she couldn't do them that night. 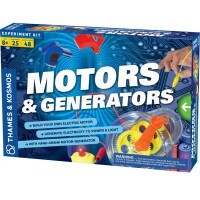 They did 3 the next day however.